Can I buy spare INCRA parts directly from you? Absolutely! Please contact us with your needs. Where can I download a manual for my INCRA product? You will find manuals under Product Manuals. All available owner's manuals are stored in PDF format. To download your manual, simply click on the appropriate product name below. You must have the FREE Adobe Acrobat Reader Software installed to view this manual in your browser. If you are not able to view the manual or you do not have Adobe Acrobat installed, you may download it here. Simply follow the instructions provided by Adobe. Older or under-powered computers may have trouble printing the more detailed pages or even the entire manual. In these cases, please contact us for a free replacement manual. We are open from 8:30 to 5:00 Central Time, Monday through Friday, except holidays. Our Product Pages and the rest of our online information are available to help you 24/7. 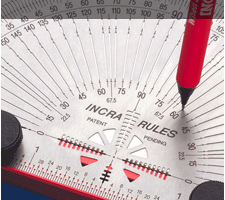 INCRA is the brand name legally registered as a trademark by Taylor Design Group, Inc. After inventing and refining his first two products, Chris Taylor founded the company in January 1987 and immediately introduced the Incra Positioning Jig and the INCRA Gauge. Before he started inventing woodworking tools full-time, Chris was an electrical engineer and serious woodworker. 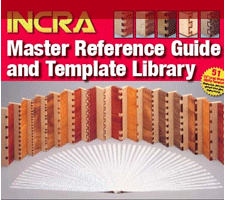 INCRA has been a great help to many woodworkers with continuous creative innovation since 1986. Yes. 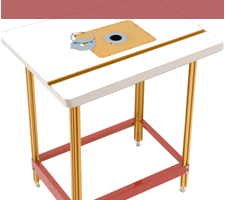 An offset-style table is ideal, but conventional center-mount router table can have a simple extension added to allow reasonable fence travel for the LS system. Tips for adding an extension are in the LS Positioner owner's manual. The quality of the router table will affect your results. For an Incra system to perform properly, the router mounting plate must fit without play in the table opening, and the reducing rings around the router bit must be very level with the surrounding plate. I'm building an offset-style router table for an LS system. What are the ideal dimensions? The outside dimensions aren't particularly important but the distances from the router's center to the table's edges are worth considering. Parallel to the fence, the infeed edge of the table should be between 12" and 16" (more than 16" can make the table uncomfortable to use). Parallel to the positioner's carriage, the edge of the table should be 29" from the router's center for LS17 Systems and 37" from the router's center for LS25 Systems. There is quite a bit of latitude for shortening these ideal dimensions, and the LS Positioner's base housing also does not need to be mounted fully on the router table; it can be mounted so that as much as 6" of the base housing's length projects off the edge of the router table. What's the size of the INCRA Router Lifts and MagnaLOCK Router Plates? They are 9-1/4" x 11-3/4" (9.250" x 11.750") in outside dimensions and 3/8" thick. The openings in Incra router tables are about 0.020" larger in each dimension. 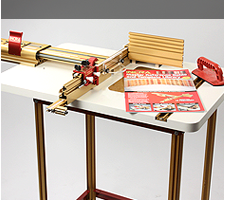 There is no industry standard opening, but this rough size is the most commonly used and Incra router tables and plates are designed to be compatible with Woodpeckers products. I have a router table attached to my table saw. How can I mount an LS Router System so it can be easily removed? The oval top section of the positioner's base can be removed from the T-slotted sub base. This oval section can then be attached to a piece of good-quality 3/4" plywood and then mounted in a variety of ways. A wooden router table encourages using knobs through the plywood threaded into T-nuts inserted into the underside of the router table. For a cast iron table saw top, an INCRA Miter Slider can be attached to the bottom of the plywood platform, and then the Miter Slider can lock the plywood platform and LS positioner into the saw's miter slot where it can be used with the router table. The LS17 will likely cover every routing operation you'll encounter, but the LS25 will rout to the center of a larger panel. The LS25 provides a 50% increase in capacity for only $30 more. The LS25 could someday be set up as a replacement rip fence on the TS rail system, while the LS17 doesn't have the travel necessary for an everyday rip fence. What's the widest board I can dovetail? The theoretical limit is the fence travel of the positioner, either 17" or 25". The realistic limit is about 18", though there are many cases where folks have gone well beyond that. Bigger material is a bigger challenge. However, for the most common jobs like dovetailing drawers and boxes, an INCRA system is far faster than any jig because it allows you to cut several boards simultaneously. How easy is the system to learn? For the general routing you'll be doing most, it takes maybe ten minutes to become familiar with the system, and the accuracy and repeatability will spoil you on the very first day. For box joints and dovetails, give it an afternoon and practice with poplar before you get into the middle of an important project. The joinery instructions are clear, and the video is a fantastic companion. 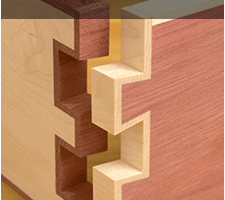 It's not much different than learning to use a conventional dovetail jig. How do the joinery templates work? Each template has one series of lines for each portion of the joint. On a half blind dovetail, for example, there are two sets of lines on the template - one for each board in the corner. For one board in the joint, you would lock the carriage make a cut as each line marked on the template is aligned under the cursor. To make the mating cuts into the other board, you would stop at each line labeled "B" on the template and make a cut. The lines on the templates correspond to the mechanical 1/32" increments of the positioner, and those mechanics position the fence with an accuracy 5 to 10 times better than your eyesight looking through the cursor onto the template. Can I add the Wonder Fence later? Yes, the Wonder Fence works directly with the joinery fence on the LS Standard Systems, and it will work with Incra Ultra systems that are equipped with the current Pro-II Joinery Fence. Do you use zero-clearance inserts? The INCRA Router Systems achieve full zero-clearance with a very economical, convenient, and complete solution. Instead of using a plastic insert, the systems include hardware and instructions for making zero-clearance sub-fences from scrap wood you already have. The subfence is cut with the fence fully locked, and automatically compensates for the pilot bearings found on edge-forming router bits. The sub fences can be used with the halves offset for edge jointing or moulding, allowing zero clearance in a situation where an insert can't be used. It's economical because there's no need to buy replacement inserts, and it's fast because there is no second or third cutting operation necessary to accommodate router bits with pilot bearings. Probably. If your saw is less than 28-1/2" deep (measured along the miter slot) and has flat surfaces at the front and rear that are square to the top, you should be in good shape. The adjustable hardware will use the existing holes in the saw in 95% of installations. Extension wings and side tables are not required, as the rails mount only to the central part of the saw's top. If your saw is more than 28-1/2" deep, TS-LS systems are available with a longer fence and base support panel to handle saws up to 35" deep. Smaller saws such as bench-top and jobsite saws may need drilling and will generally need support legs under the rails. The TS Rail System is not compatible with Ryobi saws or the Jet Super Saw when it's equipped with Jet's sliding table accessory. See the TS Compatibility Table for more information. 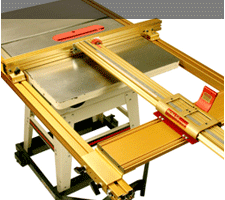 Note: INCRA TS Router Tables are designed to work with saws 27"-28" deep. It's very straightforward, typically two hours of turning wrenches. Everything is adjustable, and the rails are self-leveling and self-aligning. Click to view the TS-LS owner's manual. Combinations including TS router tables and routing accessories include a huge amount of INCRA equipment, so setting up the entire saw/router system normally takes an afternoon. It mostly depends on whether 32" ripping capacity is enough, or if you need 52". The TS-LS 32" has more than enough capacity to build standard size kitchen and bathroom cabinets. Shop space can also be a deciding factor, and the TS-LS 52" will be a tight fit in smaller shops. Before shoehorning a high-capacity system into a small work space, consider that it takes an open area of roughly 11ft x 18ft to maneuver and rip or crosscut 4'x8' sheet goods regardless of the style of saw or brand of rip fence. The current width of the saw and its various extensions isn't a factor when choosing between the 32"- and 52"-capacity systems, but the long rails of the TS-LS 52" will be a closer match for an existing wooden right-side extension table if your current rip fence has 50"+ capacity. The rails on the TS-LS 32" are 72" long, and the overall width is 102" when positioner's carriage is extended for maximum rip. The right-hand ends of the rails are typically set 45" from the blade. The TS-LS 52" has 92" rails, and the overall width is 122" when set for maximum rip. The right-hand ends of the rails are typically set 65" from the blade. When are support legs necessary? Legs are not necessary when installing the TS-LS 32" on floor-standing contractor's saws or cabinet saws. Support legs are also not needed when installing our left-side TS router table. Legs are required when mounting a substantial extension or a TS router table to the right of the saw on all but the heaviest cabinet saws, and some support is required whenever the 92" rails are installed or the 72" rails positioned further to the right than on a typical installation. Does it require side tables? No. The TS rail system attaches only to the central part of the saw's top, and the rails will serve as the anchor point for any other accessories such as support legs, TS router tables, etc. Because the rip fence performs perfectly with wide open spaces on either side of the saw, you have flexibility in deciding how to lay out the system you might keep your saw's metal wings, replace a wing with a router table, reuse an existing wooden extension table, or build an extension table from scratch. 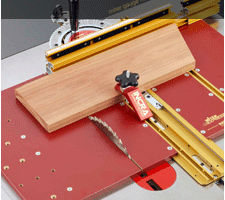 Is it better to have the router table at the saw or a separate router table? Because the table saw and router table are the two most frequently used stations in most shops, thereظآs no question that having a separate router table is more convenient and efficient. The drawback is the cost of separate Incra systems and slightly more shop space. If your budget or shop space are limited, installing a router table at the saw is a reasonable means of getting the same accuracy for both operations. Is the left router table or right router table better? It's partly personal preference and will partly depend on the saw. The router tables generally replace the saw's metal extension wing on the appropriate side, and cabinet saws and hybrid-style saws will often have a motor housing that would interfere with the router's motor either on the left or the right. Visit the TS System Planner and TS Compatibility Table for details. The right-side table helps fill in that area of the saw and doesn't require moving the base assembly for routing, but it also limits routing capacity, limits access around the router, and forces you to lower the router bit to get back to sawing operations. The right-side router table also requires legs, which is a consideration if you move your saw frequently. The left side table allows full capacity, much better access around the router, and doesn't require the use of legs. It does require sliding the TS base assembly down the rails (there are stops for repeatability), and there is less work space in front of the fence roughly the same amount as on most center-mount stand-alone router tables. Are the tables compatible with earlier TS models? 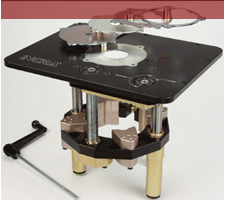 The current TS router tables and mounting hardware are compatible as far back as the Ultra TS-III introduced in 1999. 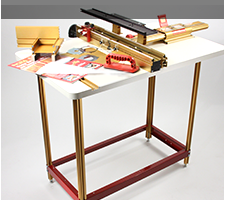 The router table hardware is sold separately and can dramatically simplifies the installation of user-made tables on any TS system that uses the gold aluminum rails. Is there a difference between the routing accessories in the TS Combos and the stand-alone LS router systems? The systems share the same broad range of routing applications, and the routing accessories are for the TS Combos are duplicated exactly with one exception: the Wonder Fence extrusion has no provision for accepting the telescoping stop extender bar that's standard on the LS router table systems. 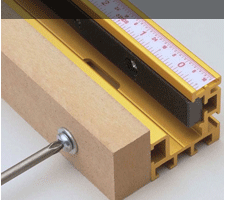 Are there any limitations in routing with a TS joinery systems compared to a stand-alone system? As far as the system's capabilities are concerned, there are no limitations, and TS-based routing setups are capable of the same operations as Incra router table systems. Having the shop's primary router table separate from the saw still be more convenient and efficient, though, since with a TS-base system one doesn't have access to the saw while routing and vice versa. Can the TS routing accessories be adapted to earlier TS models? Yes, though it's recommended that TS systems built in 1999 and earlier upgrade the rip fence extrusion to the current TS-3A fence. The newer fence has a machined front face that allows better alignment between the infeed and outfeed sections of the Wonder Fence. What size miter slots to the INCRA Miter Gauges fit? 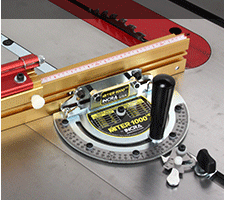 What's the difference between the Miter Express and Miter5000? They both have 24" panel capacity, full zero clearance, and greater safety & control when cutting small parts. 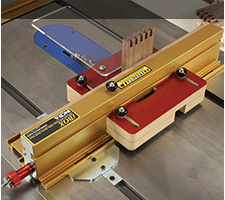 The Express is more compact, less expensive, and is sold without a miter gauge or fence. The quick release allows it to accept any brand of miter gauge and allows the use of the miter on different shop machinery. The Miter5000 has larger panels to better support plywood, the mechanics of the Miter3000 are built in, and it has INCRA's longest extending fence (36-60"). When comparing the Miter5000 to the Miter Express / Miter1000SE Combo, the Express combo is more versatile because of the quick-release for the miter gauge, and the combo can be more easily upgraded later with a longer fence, larger panels, etc. The 1000SE has a more compact fence (18-31"), has 41 positive stops at the most common angles, and the vernier scale reads all the way to tenths of a degree. The 3000SE has a longer fence (27-49") and miter bar. It also has 364 positive stops 1/2 degree apart, but it lacks a vernier scale. We have the Miter Express (SMITEREXPRESS), Miter 5000 (SMITER5000) and Miter V120 (SMITERV120) are also available for those machines. What are the benefits of using a sled v.s. a miter gauge?